We learned that consistency is still key. 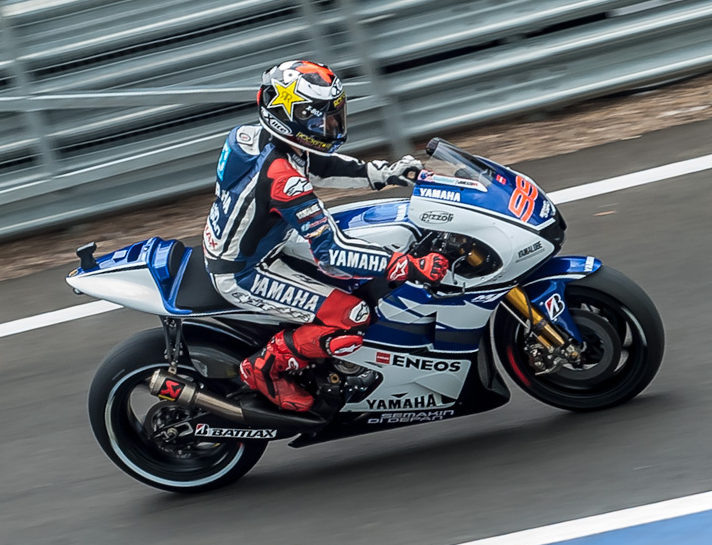 Jorge Lorenzo put together a season that was, until Valencia at least, the absolute model of consistency. It was that early form up to Assen that ultimately won him the 2012 MotoGP crown, as Dani Pedrosa would only average a top four finish over the same period in relation to the Mallorcan’s average of top two finishes. Yamaha came out of the winter swinging after being deposed as champions in 2011 and were on the pace right from the red lights going out at Qatar as the Hondas struggled to get to grips with the new Bridgestone front tyre. Whether it was the tyre issues or something a little more deep-rooted, Casey’s ability to mask the problems with a win at Jerez still meant the issues needing fixing…and quickly. One point that was made was the lack of track time from Stoner during pre-season testing. The introduction of the 1000cc engines meant heavier breaking and more acceleration therefore putting more strain on the forearms of the riders than the smaller and lighter 800s. The clear lack of race simulations during the Sepang tests held the Aussie at a disadvantage during the opening race suffering arm pump towards the end and unable to raise a challenge to eventual winner Lorenzo. The two thirds and a fourth over the opening races of the season effectively lost Dani the Championship he craves. Even had the debacle at Misano not happened, which in turn would maybe have seen a different outcome at Phillip Island, Jorge would still have been crowned King. If we look at it from a ‘what if’ perspective Dani was going to win at Misano, he was in a rich vein of form and had lead every session. At Phillip Island however it wasn’t so cut and dried, Casey was in the imperious position at his home circuit and Lorenzo had the upper-hand over Pedrosa, and Dani knew this so had to go all or nothing but had the Misano result been different then even so the best Dani could’ve hoped for was third just like at Laguna Seca. Dani won seven races to Jorge’s six, a small consolation in the grand scheme of things but Lorenzo’s master class showed it invariably takes more than just outright wins to achieve your dream, ask Casey or Valentino, as both dominated during their championship winning years. MotoGP unlike Moto2 and Moto3 rarely goes down to the final round, 2006 was the last time that happened and that wasn’t due to two riders fighting tooth and nail and sharing wins as eventual champion. Nicky Hayden only won one race all season, his home GP at Laguna Seca, so it wasn’t that. Was it due to personal problems and being distracted by a multi-million euro tax bill courtesy of his former management group that lost Rossi the title? Probably. Was it due to the consistency of the American over the Italian that saw him victorious? Yes. Consistency IS the key. CRT is a necessary evil. Yes CRT is a necessary evil. Who in their right mind wants to see a paltry grid of just 14 riders, assuming everyone stays fit, lining up at the start of a race…not me! I was fortunate to grow up watching 30+ rider grids in the 500cc GP days, there was no better spectacle than that lot barrelling in to turn one and hoping they all come out the other side. CRT doesn’t quite lift us to that level but it is a little more entertaining nowadays compared to recent years almost ‘parade lap’ starts. 2012 was always going to be a huge learning curve for the Claiming Rules Teams as it is for any new motorcycle at any level of racing. Many people were keen to make direct comparisons with their more illustrious prototype rivals. The acceptable gap was deemed to be in the three second per lap bracket meaning that at most circuits the backmarkers wouldn’t be lapped, and so it proved. Rarely was a healthy CRT bike lapped in good weather, at Valencia in the trickiest of wet/dry conditions an ART CRT actually lead in the hands of Aleix Espagaro! Whilst the powers that be know it’s not the long term answer to depleted grids and economic hardship it is difficult to argue against it being a suitable stop-gap whilst acceptable new rules and, more importantly manufacturer input, were thrashed out at length rather than rushed out and ultimately flawed. For 2014 all teams will use a spec. ECU provided by Dorna. In addition to this the prototype GP machines will be limited to 20 litres of fuel for the race and still limited to six engines. Honda has announced they will supply customer RCV213V’s to teams whilst Yamaha have committed to supplying YZR M1 engines to customers producing their own chassis. Manufacturers will also supply the software for the spec ECU but specifically designed for customer use, that is to say a step down from the full factory software developed for the principal teams. The drop in fuel capacity versus ‘factory’ machinery with customer electronics, it is hoped, will narrow the gap that currently exists between prototypes and the rest of the grid. That is the aim, but don’t expect any changes to the top five any time soon. Rarely am I at a loss for things to say. Marc Marquez’s overall performance at both the GP and post-season test at Valencia almost left me in such a position. The Moto2 World Champion started the season with a bang at Qatar putting many a hard move on his rivals and ruffling more than a few feathers. His passing technique has been put under the microscope throughout the season and to be honest, it’s not without good reason and his wholly-avoidable crash with Rattapak Wilairot at Phillip Island in 2011 was still fresh in the minds of the series organisers. Post-season testing was another point proved that the elder Marquez is just a little bit talented. He took just 28 laps on a MotoGP bike to post a time of around a second off his bang on form team-mate for 2013 Dani Pedrosa…28 laps!!! Most rookies don’t get that close to their team-mates over a season let alone a wet Wednesday afternoon in southern Spain! David Emmett of MotoMatters.com explains it in eye-opening detail more here..
Casey Stoner WILL be missed. Well, missed by anyone who has even the most basic understanding of racing, that is. His MotoGP peers readily acknowledge that Casey Stoner is unquestionably the fastest man of his generation. His ability and feel on a racing motorcycle surpassed that of even Valentino Rossi, his uncanny knack of just getting on and riding the wheels off his bikes left most on-lookers spellbound. I recently read that Casey once pulled in to the garage complaining there was a problem with his engine. The technicians poured over the bike and the telemetry looking for anything that may cause a problem but found nothing and he was sent back out. The engine lasted three corners and immediately expired. Where Rossi is media friendly and plays the ‘cheeky chappy’ role so well, Casey is the absolute opposite. Racing motorcycles is his job; it’s what he’s paid to do and what he does best. He has no interest in waving and blowing kisses to the camera he just wants to race…and win. The behind-the-scenes politics and perceived dumbing-down of the sport has left a sour taste in the out-spoken Aussies mouth and ultimately cost the sport a majestic talent. With his visor and mouth shut he was undeniably world class, it was when the two were reversed that riled some sections of fans the most. ‘Casey Moaner’ was the name tag of choice for HRC’s golden boy; every negative comment was picked up on and magnified beyond necessity where in real terms he was just telling the truth. Being lambasted for being honest and not playing the PR card at every opportunity and that in itself is disappointing. His ‘Gone Fishin’’ logo at Valencia was a double-edged sword, yes he’s gone home to his ranch to spend his days by the lake but he also spent most of his MotoGP career ‘fishin’’ with journos and fans alike and got a bite almost every time. See ya Casey, thanks for everything. Summer 2010 ‘We can fix that bike in 80 seconds’ was the cry from Jerry Burgess, ‘Casey isn’t trying’ said Valentino. Fast forward to summer 2012 ‘He’s a bit good isn’t he’, muttered Valentino. Both Rossi and Ducati’s reputations have been left tarnished by the last two years of toil and abject disappointment. Even the much-heralded buy out of the Bologna marque by the German automotive giants Audi wasn’t enough to retain the services of the nine-time world champion and his experienced crew. What went wrong? Nothing. It was all wrong to start with and never improved beyond that. Ducati is far from an HRC or YRT in terms of development and new parts turnaround time, VR possibly lacks the conviction to ride a bike on the edge of a crash at every available opportunity like his predecessor, also his inherent 250-style of carrying high corner speed and loading the front tyre of the notoriously rear wheel-biased Ducati was a match made in hell compared to the style of his superbike-schooled team-mate Nicky Hayden and his tail-sliding predecessor. You do not become a bad rider overnight and Rossi certainly hasn’t. Has now has to undergo a confidence rebuild and that will take a little time. He is two years older than when he last rode for Yamaha, putting him irretrievably into his early thirties, couple this with the fact that Lorenzo, Pedrosa and Stoner have raised the bar leaving MotoGP’s favourite son with work to do as his previous levels are no longer enough to challenge for podiums let alone wins. It is no doubt good for the show that Rossi has returned to Yamaha for two more seasons. With Lorenzo and Pedrosa at the top of their game, Marquez entering where Casey left and factor in Bradl and Crutchlow constantly on the cusp of the podium 2013 is, without doubt, the most eagerly awaited championship in many years. The biggest thing we learned about MotoGP in 2012? That 2013 is going to be even better.